Like so many plans that go badly array, it must have seemed a great idea, at least in the beginning. With a bold move, the Greek prime minister, Antonis Samaras would at once show the country's lenders that his flagging reform program was back on tracks and appeal to his conservative base by getting rid of a symbol of public sector extravagance. What could go wrong? Unfortunately for the Greek government just about everything. The decision 11 days ago by the ministry of finance to announce the immediate closure of Greece's public broadcaster, ERT set in motion a series of events that is now threatening to bring down the uneasy coalition that has been in power since last summer's elections. The departure of the Democratic Left from the three party coalition yesterday in protest over the handling of the ERT affair has seriously weakened the PM's hand and revealed that just how unstable the partnership with PASOK has become. This is just one in a series of political miscalculations that has turned a political gamble into a political nightmare for Samaras, both at home and abroad, garnering yet more criticism and negative publicity for the country at exactly the time the leadership has been boasting to any media outlet who would listen of its success in turning the economy around. The live TV images of ERT reporters warning of impending police action only to be replaced by a black screen shocked many Greeks, especially among the older generation who had witnessed similar media black outs during the Regime of the Colonels (1967-1974). For foreign observers such as The European Broadcast Union and the Head of the BBC the sudden cutting off of a public broadcaster whilst on air was unprecedented in post war Europe and a direct attack on democratic values and freedom of the press. 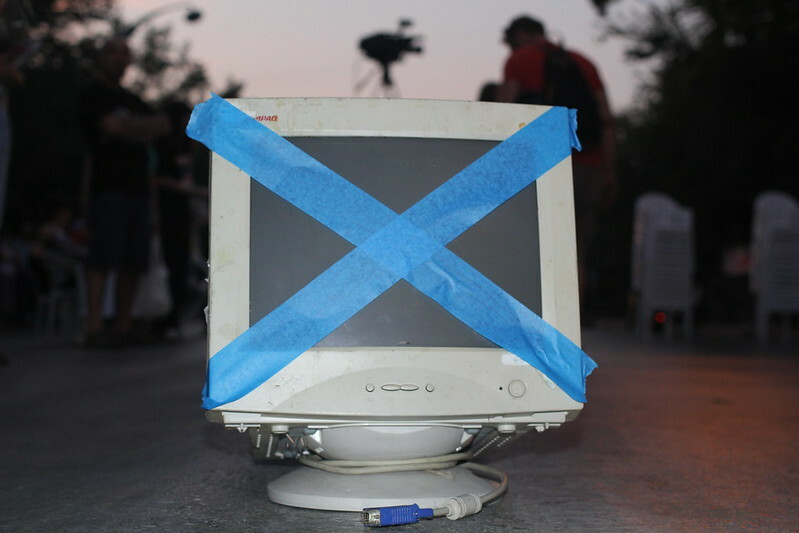 Instead of a few days of protests by the employees of ERT which could easily be ignored by pro-government private media the government was faced with a media insurrection as journalists and technicians defied threats by the authorities to continue broadcasting, using internet live streaming, unused analogue signals, satellite etc. This, along with the social media storm created meant that thousands turned up outside state run studios in Athens, Thessaloniki and other cities to protect those inside from the riot police units that quickly deployed around such facilities. Instead of stifling the voice of those working in ERT these actions encouraged people to find their signal in any way they could and demand via the live streaming channel provided by the EBU grew so rapidly it overwhelmed the site's capacity. The quick surgical strike that New Democracy advisers had promised was now turning into a long drawn out and very public shouting match in which the government was being viewed as bullying autocrats rather than bold reformers taking on an arrogant publically funded elite. The decision by the Council of State that ERT be allowed to go back on air via its normal broadcast facilities was ignored so adding to the sense that Samaras was acting as if he and his ministers were above the law, a point the opposition SYRIZA party seized upon in order to appeal to disillusioned PASOK supporters, increasingly frustrated with their own party leadership. Now the authorities are on the horns of a dilemma, if they back down over the ERT closure, then this will likely re-ignite anti-austerity opposition and provide a template for future battles over the sale off of publically owned power and water utilities. On the other hand a swift, police raid to empty the occupied broadcasting facilities would be a PR disaster, both at home and abroad as well as possibly shattering the fragile alliance with the PASOK party.